Conchoidal fracture describes the way that brittle materials break or fracture when they do not follow any natural planes of separation. 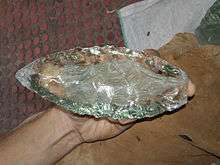 Materials that break in this way include quartz, flint, quartzite, jasper and other fine-grained or amorphous materials with a composition of pure silica, such as obsidian and window glass. Conchoidal fractures can also occur in other materials under favorable circumstances. This material property was widely used in the Stone Age to make sharp tools, and minerals that fractured in this fashion were widely traded as a desirable raw material. Conchoidal fractures often result in a curved breakage surface that resembles the rippling, gradual curves of a mussel shell; the word "conchoid" is derived from the word for this animal (Greek konche). A swelling appears at the point of impact called the bulb of percussion. Shock waves emanating outwards from this point leave their mark on the stone as ripples. Other conchoidal features include small fissures emanating from the bulb of percussion. 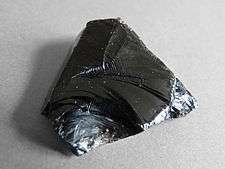 They are defined in contrast to the faceted fractures often seen in single crystals such as semiconductor wafers and gemstones, and the high-energy ductile fracture surfaces desirable in most structural applications. In lithic stone tools, conchoidal fractures form the basis of flint knapping, since the shape of the broken surface is controlled only by the stresses applied, and not by some preferred orientation of the material. This property also makes such fractures useful in engineering, since they provide a permanent record of the stress state at the time of failure. As conchoidal fractures can be produced only by mechanical impact, rather than frost cracking for example, they can be a useful method of differentiating prehistoric stone tools from natural stones. ↑ "conchoidal". Merriam-Webster Online. Retrieved 2010-10-30.